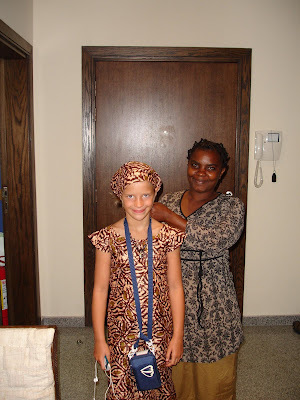 Sofie has been looking forward to the Nigerian Culturday all week. So today, she dressed in the Nigerian outfit her nanny Joy has made her for the occation. Joy arrived a bit early this morning and made sure that Sofie was properly dressed and fixed her headband. There were a slight issue with Sofie demanding to wear sock and shoes instead of sandals, but you don't mess with a tired Sofie - we let her wear black dress shoes and white socks. 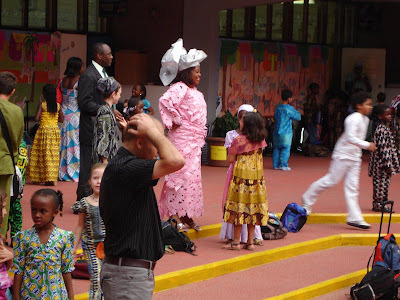 The whole school was colourful wearing clothing today, staff, students and parents. In the picture you see grade 2 sitting and watching a horseshow on the soccerfields. 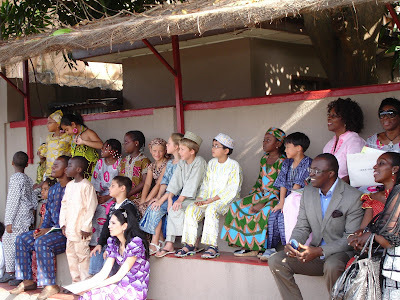 Some of the parents had even taken the traditional Nigerian head wraps on, and that made a difference for sure. So many colourful hat-like head wraps I have never seen in one place before. When we arrived at school it was decorated beyond recognition. Leafs from the Coconut palm tree made a new entrance. 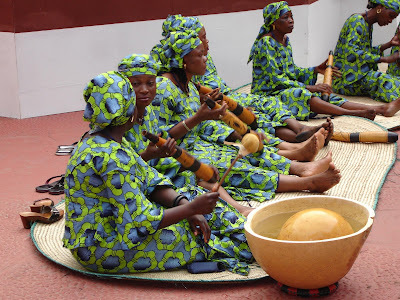 When we came to the school court female musicians where sitting there whith their rythmic instruments playing. The tenniscourts were turned into a marked place today, and the student got to practice their negotiations skills - making good bargains with the traders.